Four years before sweeping the Oscars with The Shape of Water, Guillermo del Toro made Pacific Rim, a movie about giant robots fighting giant monsters. Despite generally good reviews and respectable box office business, few people, if any, proclaimed it to be great art. In its own way, though, it kind of was. One need look no further than the sequel, Pacific Rim Uprising, for proof. The same concept has been redone here, in a manner that feels staid where the original was thrilling. John Boyega stars as Jake Pentecost, the son of Idris Elba's character from the first film. After getting caught stealing Jaeger (giant robot) parts, he is faced with a choice: go to jail or help train a crew of young Jaeger pilots. Jake chooses the latter, bringing with him Amara (Cailee Spaeny), a teen girl who builds her own Jaegers out of scraps. What follows is an incredibly dull, needlessly complex story, not worth recapping in any sort of detail. The important thing to know is that more Kaiju (giant monsters) are unleashed, with a plan to destroy all of humanity. The first Pacific Rim was a love letter to Japanese monster movies. A big part of the fun was that the Jaegers all had their own individual gizmos, and the Kaiju possessed their own particular powers. The arrival of each new creature brought with it a sense of excitement, as you waited to see what it could do and how the Jaegers would use their tools to fight it. 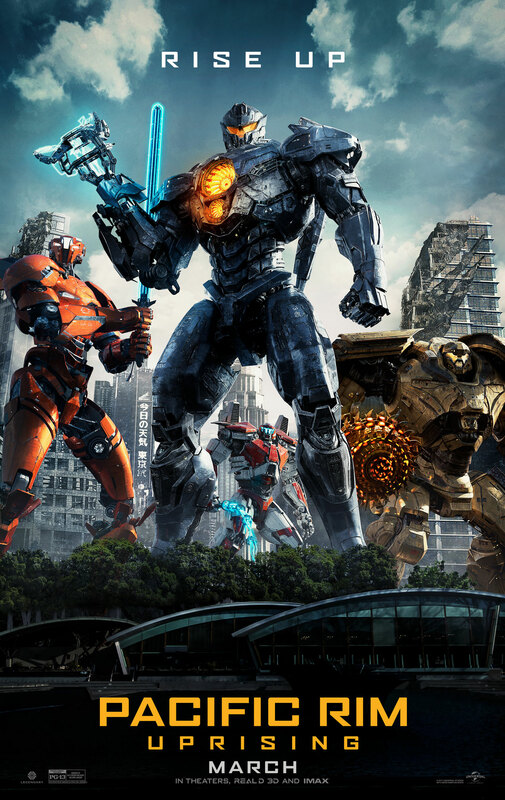 Pacific Rim Uprising has generic Jaegers and Kaiju. That sense of discovery is lost. Very little time is spent affectionately obsessing over them, as del Toro did. You could feel his passion in the subject. Sequel director Steven S. DeKnight seems to be simply fulfilling a mandate to make an action-packed follow-up. Kaiju don't really even show up until the last 25 minutes. Instead, the earlier action scenes involve Jaegers and Jaegers that are being controlled by Kaiju brains. (This review must sound extremely weird by this point.) We are therefore treated to giant robots fighting other giant robots. After five Transformers movies, this is fine, but not exactly a novel idea anymore. One-dimensional characterization hurts Uprising too. John Boyega is an immensely likable, charismatic actor. Jake, however, is a stock character – the screw-up who gets One Last Chance to prove himself. Boyega can only do so much to make him interesting. Scott Eastwood plays Jake's co-pilot, Nate Lambert. They enact a predictable arc in which old tensions between them are resolved via their efforts to save mankind. Charlie Day returns as Dr. Geiszler. He was terrific comic relief in the original. This time, the character feels shoehorned in, which dramatically reduces his impact. For two-thirds of its running time, Pacific Rim Uprising is somewhat of a drag, punctuated by intermittent amusing action sequences. Then the last third abruptly becomes wildly enjoyable, as Jaegers and Kaiju engage in a city-destroying battle, leading to a desperate attempt by Jake and Amara to prevent global annihilation. Here's the thing: massive robots and monsters fighting each other will never not be cool. Whereas most of the movie is a little on the bland side, the big finale definitely gives plenty of bang for your buck. Pacific Rim Uprising might have played a little better if it were not a sequel. This isn't a bad movie per se, just a formulaic one with an amazing ending. That said, it suffers from being a notable step down from its predecessor, which was infused with Guillermo del Toro's distinct touches and palpable appreciation for monster cinema. Pacific Rim: Uprising is rated PG-13 for sequences of sci-fi violence and action, and some language. The running time is 1 hour and 51 minutes.